This fine antique George III sterling silver gravy spoon has been crafted in the Fiddle pattern. The anterior surface of the handle terminal is embellished with the contemporary bright cut engraved initials 'MWL'. 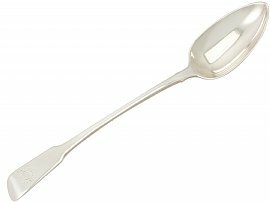 The reverse of the spoon features a rounded heel to the bowl and a pip to the handle terminal. This antique Fiddle pattern spoon is a very good gauge of silver, fine quality and in excellent presentation condition. Full hallmarks struck to the reverse of the handle are very clear.